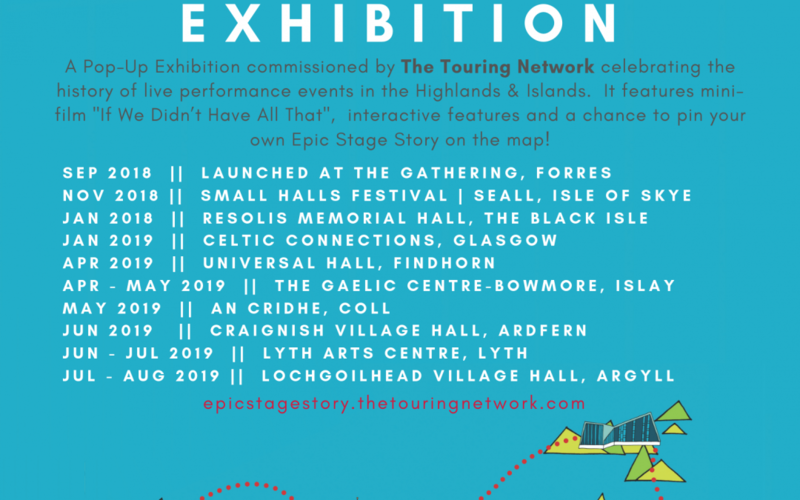 In 2018, film makers Beth Chalmers and Jassy Earl, along with researcher, Kerry Duncan, travelled around the region collecting stories and pin pointing key milestones that track the heritage of the Network as well as the wider history of touring performers coming to the region! Their travels have formed an incredible collection of stories and archive material-stories about bus break-downs, unexpected audience participation, halls packed to the brim, cultural resonance and of course your communities! This is your Epic Stage Story. The exhibit is a super wee display celebrating the story of the network over the past 20 years. It folds out to reveal little interactive stories beautifully illustrated by Rosie Cunningham of Illustration, etc and designed and assembled lovingly by Jen Kilgour. There is a small screen (and headset) showing film “If We Didn’t Have All That” as well as plenty of fascinating archive materials on display. Should you be interested in hosting the pop-up exhibition (note there is no charge for members looking to host the exhibition) please email Rhiannon to let her know.